I'm really inspired by the tentacle mechanism video tutorial. 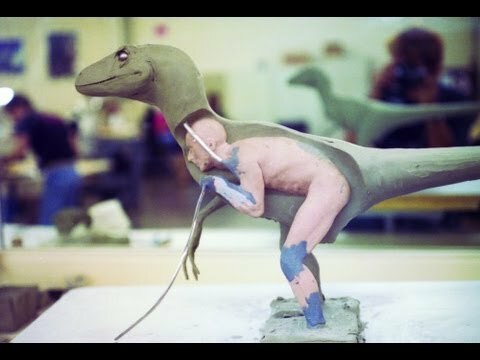 But I'm also interested in the neck mechanism in the original Jurassic Park raptor suits. At around 1:40 we get a glimpse of this. How does the twisting action work? Could such a mechanism be incorporated into a tentacle or tail? Such a mechanism would be very useful for the flippers of an aquatic creature or mermaid, or allow a long necked dinosaur or giraffe to turn it's head and neck realistically. I don't have any reference for the neck mechanism for the raptors. The part of the video you are referencing does not (I believe) have any mechanism in the neck and is relying on body movement to sway the head, as that segment of the video focuses on how the neck structure was designed to be flexible. It's possible that some of the test footage has the performer using his arm to move the head, but that is just my guess.